Win Paddington 2: Bring this adorable bear into your home | SWITCH. Making a welcomed return after the success of the original, 'Paddington 2' is back to warm our hearts and homes. Ben Whishaw ('Perfume', 'Cloud Atlas'), proclaimed to be one of the best young actors of his generation, is the voice of loveable Paddington Bear. Wishaw stars alongside iconic actors Hugh Grant ('Love Actually', 'About A Boy'), Brendan Gleeson ('Calvary', 'Smurfs 2'), Sally Hawkins ('The Shape of Water') and Hugh Bonneville (TV's 'Downton Abbey'). A few years have passed since Paddington has settled in with the Browns in their cosy London home, bringing joy wherever he goes. When Aunt Lucy’s (Staunton) 100th birthday approaches, sweet-hearted Paddington (Wishaw) sets out to find his favourite aunty the perfect gift. His search finds him inside the old Mr. Gruber’s (Jim Broadbent, 'Moulin Rouge', 'The Iron Lady') antique shop where he is mesmerised by a unique pop-up book of London. In order to buy the prized book, he must perform a range of peculiar jobs around London - only to witness it being stolen one fateful day by a mysterious bearded thief. Poor Paddington is unfairly accused of the crime, sparking his quest to clear his name and unmask the culprit before Aunt Lucy’s big birthday celebrations. The 'Paddington 2' competition has now closed. Winners will be announced shortly. Competition opens at 5pm AEDT on Sunday 18th March 2018 and closes at 11:59pm AEDT on Sunday 25th March 2018. Five winners will be chosen at random on Monday 26th March 2018. To successfully win, entrants must fulfil the above entry conditions before the time the competition closes. Current members/followers are eligible to enter the competition. Only one entry per person. Only one winner per household. To be a valid winner, the entrant must not have won a prize from SWITCH within the last 28 days. 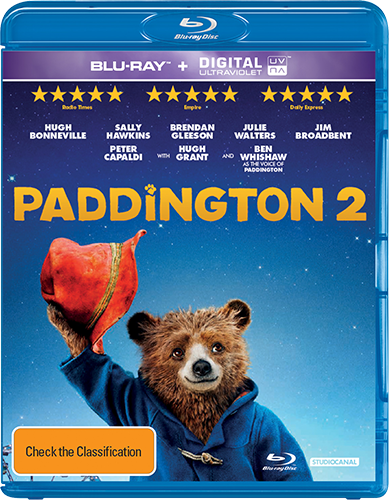 Each winner will receive one Blu-ray copy of 'Paddington 2'. By entering, you agree to receive occasional emails from SWITCH in the future. If you decide to unsubscribe from these updates, any further entries will not be applicable. Only Australian residents are eligible to enter. 'Paddington 2' is available on Blu-ray, Digital and DVD on Wednesday the 21st March 2018 from Universal Sony.